Humphrey Bogart’s specialty as an actor was embodying exhausted moral conflict. His most iconic roles generally came down to the tension between his weary eyes, his sardonic smirk, and his often heroic actions. Over and over, in films like Casablanca, Treasure Of The Sierra Madre, and The African Queen, he played characters deciding whether to take a principled stand or follow the easiest, greediest, or safest path. Sometimes his characters seem to be warring against their better natures; sometimes they just seem to be fighting to keep their nobility safely hidden behind cynicism and macho defenses. Either way, they don’t always win. 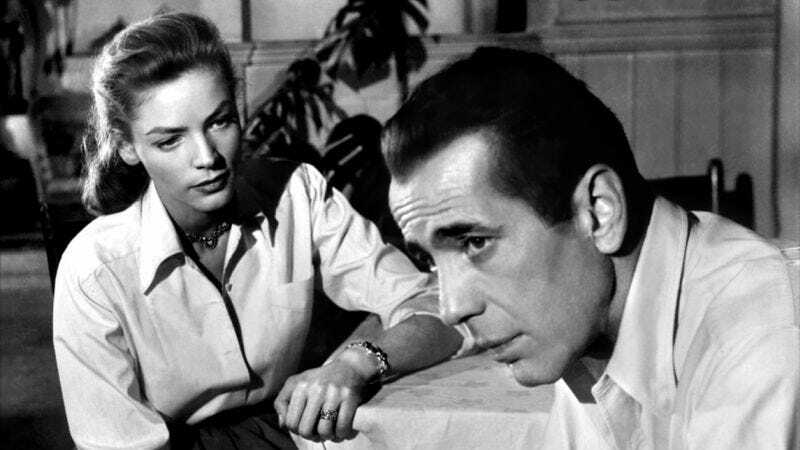 Viewers can choose for themselves which way to read Key Largo, a John Huston classic starring Bogie as a bitter World War II vet pitted against a criminal gang he claims he doesn’t want to fight. When Bogart visits the eponymous Florida-coast island to extend his condolences to a war buddy’s widow (Lauren Bacall) and father (Lionel Barrymore), he winds up trapped in their hotel by a band of gun-toting thugs waiting on an illegal delivery. Their leader, Edward G. Robinson, is a sleazy bully who takes particular interest in goading Bogart. Huston and co-writer Richard Brooks adapted the script freely from Maxwell Anderson’s 1939 play, but in their hands, it comes across more like a Tennessee Williams drama, with a large group of sweaty, tense people caught in a single setting together, alternately tearing at each other and pretending to get along, with increasing difficulty as the tensions escalate. (Brooks may have had a particular affinity for this style of story; he went on to script the film adaptations of Williams’ Cat On A Hot Tin Roof and Sweet Bird Of Youth, the latter of which he also directed.) In a particularly Williams-esque touch, a highly symbolic hurricane is bearing down on Key Largo, both upping and reflecting the interpersonal tension. It’s a facile metaphor, but Huston and Brooks earn it, both via visual excitement and with a terrific sequence where Bogart uses the storm as a psychological weapon against Robinson. Bogart’s determination to shrug off Robinson’s direct jabs looks a little like cowardice, and a lot like reluctance to be manipulated or drawn back into another war, no matter how small. But his inability to tolerate Robinson’s harassment of the other people trapped in the hotel—particularly faded, alcoholic singer Claire Trevor—takes him back into the familiar territory of reluctant hero. Key Largo is well worth watching for the fantastic cast, but particularly for Bogart’s skill at managing that balancing act. The film is also a terrific companion for The Desperate Hours, a home-invasion thriller that reverses the equation, making Bogart the desperate criminal taking over a home, holding its owner hostage, and needling his victims. There’s much less moral ambiguity and internal warfare there. Availability: On DVD solo from Warner or batched with the other Bogie and Bacall movies; via Netflix disc rental; digital rental or purchase from a few outlets.